I suggested to my co-workers that we eat lunch at Tokyo Ramen, Atria. 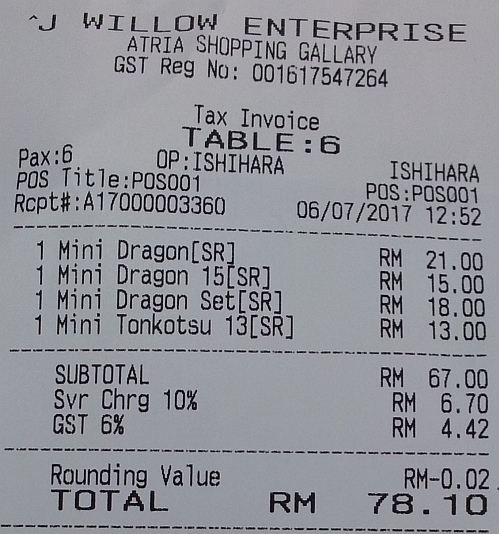 I ordered the mini Dragon Set at MYR18++ (10% service charge and 6% GST - MYR21 nett). The set consists of 3 gyoza, a small bowl of Ramen and a small bowl of rice. The broth was still as tasty as my previous visit almost a year ago. This is the amount of food that I kept for dinner. 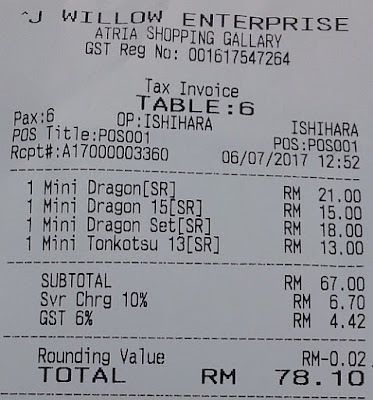 A few of my friends shared their food so the total bill is MYR78.10 nett. We were the only group eating there during lunch. Wow!!! That was all you had for dinner? I would be hungry within a couple of hours and that would keep me awake all night long. I try to eat little for dinner because I sleep early. Rice and ramen in same set?? So you finish the white rice and keep the ramen and gyoza. no, I kept half the rice and some of the ramen since I gave my friend some ramen from my bowl. Not so mini eh? Hehe, the gyoza looks good! mini when compared to the usual size. 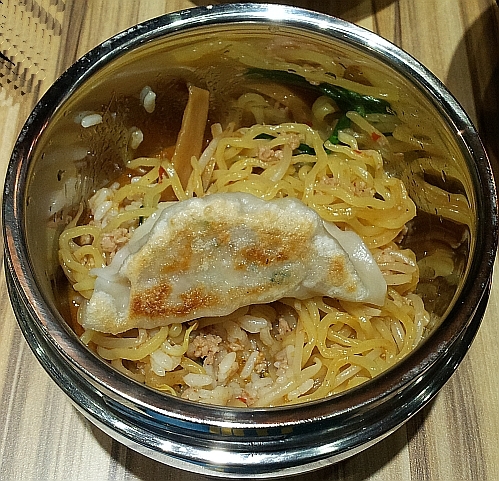 I sure cannot finish too.. taking back for dinner is a good idea..
you can order the ala carte mini ramen so can be sure can finish. When I saw your post title, I immediately thought of Tokyo Ramen! I was there last in July, I think. Had the Dragon Miso Ramen again and it is still the best. It was quiet too when I was there. This place is so underrated. aha you are so right! I hope business is good enough for them to stil go on. 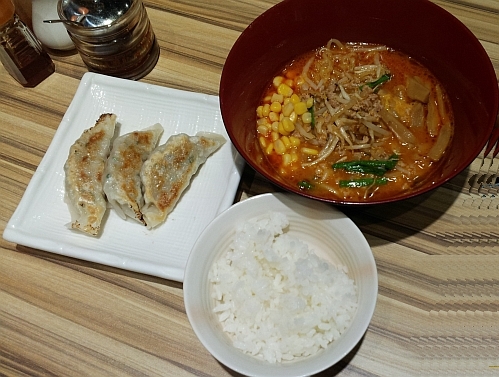 the ramen soup looks so reddish...is it spicy? spicy but not to the level that I can't take it. I miss eating this kind of food. Looks yum. Is it? I am so jealous that you have nice colleagues at meal times and could share costs & jokes too. Here, I have to avoid the unmarried female colleagues and no one else is a male Chinese in my department. Haiks. you are such a smart guy with high EQ to avoid unmarried female colleagues to prevent unnecessary gossips since everyone would think that you are a good catch. Ramen and rice in one set... I'd have preferred more noodles and then they can keep the rice. then order the normal size ramen and not the rice&ramen set. sure will have enough noodles for you.